This illustrated scene depicts the attacks led by Mara, god of death and illusion, threatened by the future Buddha’s imminent Enlightenment. The latter is portrayed seated on a diamond throne in front of a Bo tree making the symbolic gesture of the bumiparsa mudra (taking the earth as witness). Mara stands to the right of the bodhisattva in whose direction an army of demons is launching swarms of projectiles, which turn into flowers before hitting their target. The azurite blue ground conjures up the night during which the devil’s attempts took place. In the lower strip is depicted the theme of the seven treasures of the universal sovereign, an allusion to Buddha’s lordship over the “three worlds”. This work is distinguished from usual shrine paintings by its miniaturism and use of color that recall Uigur illuminated manuscripts from Turfan. 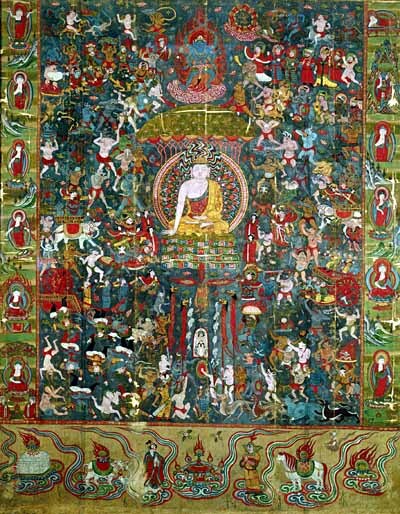 Perhaps the entirely novel composition was due to the fact that the episode was depicted using textual sources without reference to previous illustrations, as would seem to be shown by the lateral scenes featuring twelve images of Buddha, including remarkable “manifestations” unrecorded elsewhere. Similarly, the description of the conflictual, warlike gestures-indicating malignancy-of Mara’s demon soldiers has no equivalent in Buddhist imagery. The canonical permanence of Buddha is all that remains in this scene. This liturgical painting on silk was discovered in the “manuscripts cave” at Dunhuang. The theme illustrated is one of those fairly regularly featured in the cave decorations from earlier periods. The blend of iconographic influences in the painting is typical in works of the Buddhism that spread along the Serindian trade routes. This type of Buddhism is distinguished by a variety of schools founded on differences of exegetical, or more fundamentally doctrinal interpretation in their approach to teaching the way to Enlightenment. http://www.guimet.fr/wp-content/uploads/2011/10/images_musee-guimet_collections_asie-centrale_soumission_mara.jpg 514 400 Super User http://guimet.blacko/wp-content/uploads/2017/07/logo-1.png Super User2012-01-03 14:32:142012-01-03 14:32:14Episode from the life of Buddha "The Subjugation of Mara"